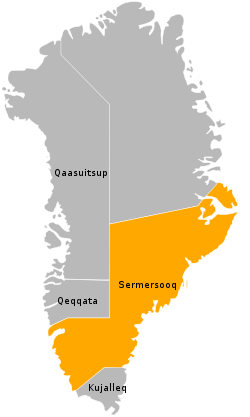 (Danish: Scoresbysund) is a town in East Greenland The town is located at approximately 70°31 N 22°00 W near the mouth of Kangertittivaq (Danish: Scoresbysund). 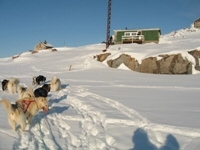 It is one of the most remote of Greenland's towns, only reachable by helicopter or by boat a few months a year. Population is 537 (as of 2005). The place is known for its wildlife which includes polar bears moskoxen, and seals. The Danish name Scoresbysund derives from the name of the Arctic explorer and whaler William Scoresby, who was the first to map the area in 1822. The Greenlandic name Ittoqqortoormiit means "Big House". Local hunters have for generations made a living from whale and polar bear hunting, and it remains, up to the present, a significant cultural-economical factor in the area. Flesh and by-products play a direct part in the economy of the hunting families. Income is gained by trading these products, but these options are seasonal and variable. Ittoqqortoormiit lies near large populations of shrimp and Greenland halibut, but the presence of sea ice prevents the exploitation of these resources year-round, and as a result fishing has never been extensively developed in the municipality. Tourism, on the other hand, is growing in importance. Copyright (c) 2007 QamutseQ. All rights reserved.